Top: Eskom Megawatt Park. Bottom-left: Public Enterprises Minister Pravin Gordhan. Bottom-right: President Cyril Ramaphosa. 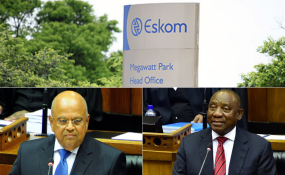 Cape Town — Public Enterprises Minister Pravin Gordhan has said that a discussion will have to be held on whether energy parastatal Eskom should be split into three separate entities, ESI Africa reports. The minister spoke at a panel discussion at the Business Economic Indaba in Midrand on Tuesday. "Should Eskom be unbundled …it's going to be a debate we have soon and it's going to be beyond a debate as we need very fast movement if we're going to have Eskom as a credible entity, both operationally and financially, even in a month's time, but you'll hear about this in due course," Gordhan said. A task team created by President Cyril Ramaphosa to gauge the sustainability of the cash-strapped power utility is due to present its findings to Cabinet this week, TimesLive said. Plans to split Eskom into three units - generation, transmission and distribution - have already been under consideration by the ANC, according to the party's treasurer-general Paul Mashitile who said so during July 2018. Gordhan's comments come after Eskom - which has R419 billion in debt - stated that it can no longer afford to subsidise consumers anymore, according to this report by Fin24.